Need help or do you have a question? Find it here! If you have a question regarding ordering, shipping, cooking or our products, please select the category below that relates to your question. If you cannot find the answer and wish to complete a QUICK SEARCH, select the category labeled OTHER and enter the "keyword" in the text box. All questions related to your keyword will display from all categories. Please provide additional comments here. Warm Weather = BIG Crawfish! When you purchase other fresh foods along with your live crawfish order, be sure to select GROUND shipping. We will include these items with your LIVE crawfish shipment. By selecting GROUND, you'll save by not having to incur additional NEXT DAY air freight charges. That's Value! 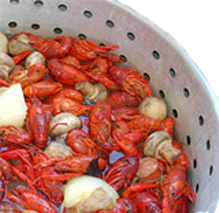 How to Boil Crawfish: includes purging, cooking and peeling instructions. How Much Crawfish Do I Need? SELECT = 12-16 cnt per lbs. Note: These amounts are based on a 3-5 lbs. per person average.